In 1968 I was very cold. I was sleeping on the floor of my university administration block which had been occupied by us students. The administration had turned off the heating. Why was I there? I was seventeen and had had very little political education or leanings. My motivation was probably similar to that of George Orwell who arriving in Catalonia with, he said, a similar lack of political education, just felt that the revolution was something he wanted to participate in. Given that Orwell went to the front in a shooting war, my experience might be described as two or three octaves down the scale. The University union was run by a selection of elected officers, generally left wing but also pragmatic, often focussing on the sabbatical that the president received and on the catering and entertaining requirements of the student body. The turnout in the student elections was generally low. But that year, revolutionary enthusiasm had gripped campuses across the land. The mechanism employed to mobilise this enthusiasm was the extraordinary general meeting (EGM), which according to the student union constitution, could be called if a certain number of people could be gathered to propose it. An EGM is nothing exceptional. It is a standard feature of many constitutions and almost always in those of public and private commercial companies (now just referred to in company legislation as a General Meeting). An EGM was called and it authorised the occupation. As the days went on opponents to the direct action mobilised and called their own EGMs and more and more students became involved and many more voted than had ever done so in the regular annual elections, and support for the occupation increased. At the last meeting the students filled the main hall of the university. Then the administration implied that it could no longer carry on university business. It would suspend lectures and would not award degrees. A further EGM was called. So many attended that it had to be held outside and the numbers were counted by passing through arches. The vote went against the militants, the occupation was called off and, in that context, 1968 was over. I think this episode throws some light on Brexit because a referendum is a form of EGM for UK PLC. But the authority of the EGM depends on the ability of those affected to call it. Without that, all you have is a snapshot of opinion at one point in time. If we have no mechanism for calling another referendum, then what does that say about the authority of the original? If only parliament can call a referendum then how can that referendum have any authority independent of it ? I obviously hope that just as in 1968, at some stage the reality principle will kick in and we will think again. And, however big a majority may be, there can always be a bigger. But I don’t think we have reached the stage for our second EGM yet. I think we may reach it at some point. The “will of the people”, after all, is a moveable feast. I don’t regret joining in the occupation. It’s core demand was that students should have a say in the composition of their studies and the principle that those involved should have a participatory role in their government at the most immediate level is one I still hold. I hold it locally as a member of the Patient Participation Committee championing co-production in the running of my local NHS, and nationally as a member of the Liberal Democratic Party, themselves the champion of localism in politics in the UK generally. I think the photo is of Gerald Hitman who was a leading figure in the occupation. He later became a controversial property developer and died in 2009. A piece published by Hackney Liberal Democrat Councillors in N16 magazine, 2011. The Hackney Lib Dem councillors have made it clear that for them it is “Hackney First” and Lib Dems are as worried as anybody that the impact of the cuts should not fall disproportionately on Hackney. That is why, for example, we have joined with the majority party to call for the retention of the Educational Maintenance Allowance. But since some people feel that our party has gone back on our principles by joining the coalition it is time to say something about why we did it, what we gave up, and what we have achieved. Labour gave us identity cards, DNA databases, imprisonment without charge, detention camps for children, overbearing scrutiny of private and public lives, erosion of civil liberties. It waged illegal war in Iraq, created massive civilian casualties and costed our soldiers’ lives. It embarked on a massive increase in public spending, building up an unsustainable deficit for which we are now paying. We could not easily join with such a party. In any case, the figures did not add up – and they did not want it. Alternatively we could plunge the country into anarchy or allow a weak conservative government to continue alone during the worse financial crisis for generations. Or we could join and influence the coalition even if it meant giving up some of our own policies. We chose to join. The public arena is now dominated by the need to reduce public expenditure – the cuts. This will inevitably hurt the poor most. Are the cuts really necessary? Imagine a family which for years spent £5 for every £4 earned and borrowed to make up the difference. It is the £1 which is the deficit, a deficit leading to a debt. That is our situation in the UK. It is not just having the debt – it is the ball and chain of interest payments which go with it. For every £1 we spend on the NHS, we spend another 42p to service debt. The debt is not wholly Labour’s fault; the deficit is. The debt can only be managed if the deficit is reduced. That is why we support the cuts. But not blindly. We are determined the cuts will be as fair, and to achieve as many of our manifesto promises, as possible. We are now yoked to a very different party. We believe in liberty, the Conservatives in authority; we believe in equality, they in differentials; we believe in society, they think there is no such thing. But we have caught the Conservative party at its most liberal and, before it starts to swing back to the far right we can work with it to produce good results, even at this fraught time. What have we achieved ? We have taken 880,000 low earners out of the tax system and this number will go up each year. We have invested £9 million in stopping tax evasion, raised capital gains tax to equal income tax, restored the link between pensions and earnings and scrapped the compulsory retirement age, introduced a banking levy, set up a Green investment bank and scrapped the ID card programme. There will be no replacement for Trident this parliament. There will be a judicial enquiry into rendition and torture. We have ended child detention. Gay men, for that alone, will no longer have a criminal record. 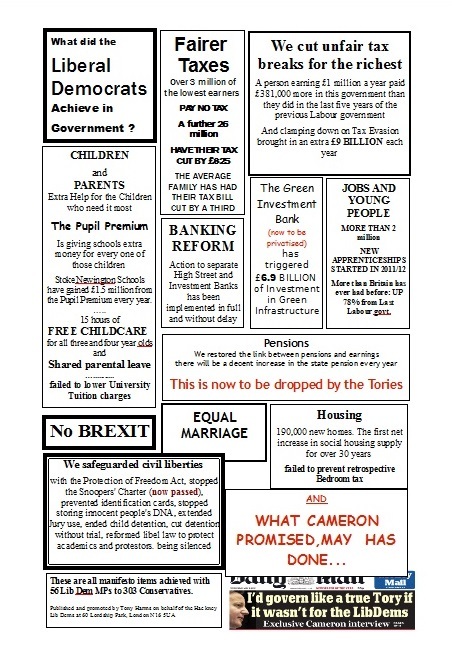 These are manifesto pledges we have carried out. Equally important is reform of the bureaucratic and over-regulated state that Labour and the Tories have left us. Power is returning to local bodies, the pupil premium will go directly to schools and we are simplifying the early years foundation stage and the national curriculum. We wanted to reduce the cost of University education. That has failed. We have, after all, 57 out of 650 MPs. But we have capped the fees at £9,000 when our partners wanted no cap at all. Ghe Quest so lanc so meer. Google tells me that it is a 14C anonymous poem but its translation left something to be desired. Ghe Quest so lanc so much more. Ghi sits alone in my ghetachte. So I had a go basing it mostly on English Homophones and looking up individual words sometimes removing the “h”. “Lanc” was a killer. Perhaps someone can translate in properly but here is my go. I sit alone with my regrets.